The Oral History Collective is delighted to be associated with the UK Research and Innovation (UKRI) Global Challenges Research Fund (GCRF) Living Deltas Hub. As part of a large, multi-disciplinary team, Professor Graham Smith and head of Newcastle University’s School of History, Professor Helen Berry, will lead a team of Research Associates a nd collaborative partners in history and oral history that will explore popular memories of environmental change across three of the world’s major delta regions. Here Graham reflects on just why the project is so exciting. River deltas comprise just one per cent of global landscapes yet support over half a billion people. Deltas are vital social-ecological systems and global food-baskets, but the landscapes and the livelihoods of those who rely on them are under threat from human exploitation, environmental degradation and climate change. Even median levels of sea level rise predicted by the IPCC could displace between three and 13 million people in Bangladesh by 2100. Focusing on three deltas in Asia, this Hub will operate on a model of equitable partnership with the delta-dwellers and the research community in Vietnam, Bangladesh and India, working together with UK and global partners to develop new knowledge and policies. The aim is to safeguard delta futures through more resilient communities and sustainable development. Such an aim is best underpinned by a greater understanding of broader historical contexts, hence History’s involvement in the Hub. The histories of the delta regions are fascinating. However, the oral histories do a bit more than simply add to that history. We will collect new subjective information about how people in the deltas recall previous attempts to address the negative impact of environmental change. 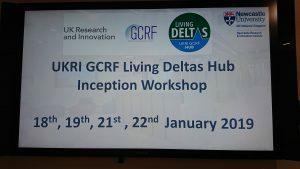 The GCRF Living Deltas Hub will work with delta-dwellers and policymakers to develop solutions that can help better realise the UN Sustainable Development Goals (SDGs) in delta-specific contexts. This entry was posted in Environmental History, Historical Justice, Oral History Collective, Partnerships by Graham. Bookmark the permalink.